Is Kashmir Safe for Tourists to Travel ? This post is the first in a series of articles detailing a recent trip that I just made to Kashmir. We traveled to some known destination as well as some remote areas of the state; places that only a few people have heard the name of. On a certain day of the trip, we actually reached the last point till where civilian vehicles were allowed. Standing there, I could clearly see the India – Pakistan border; hills that I was told by the soldiers there were part of Pakistani territory. After returning from the trip, when I sat down to write about my experience, it just made sense to first answer the question that I have been most frequently asked; both before and after the trip. Is Kashmir safe for tourists? To be honest, there is really no direct yes or no answer to this question. I have always believed that a person’s safety is in their own hands. It is driven by their own judgements, decisions and actions. The same rule applies to Kashmir as well; and to any other destination as a matter of fact. My idea of writing this article is not to pass a verdict on whether or not Kashmir is safe for tourist; but rather to jot down a few of my own observations. Being as neutral as I can, I will just mention the facts that I observed; and you can then decide whether or not you want to travel to Kashmir. Is it Safe for Tourists to Visit Kashmir? This was not really my first time in Kashmir. I have been there before a few times, but only while on my way to Ladakh. So during those trips, I only covered the Jammu – Srinagar highway; stayed in Srinagar for a night; and then traveled to Leh while crossing towns like Ganderbal, Kangan, Sonamarg and Drass on the way. This was more of a passing through rather than visiting Kashmir. So this time, my idea of the trip was to arrive in Srinagar and then spend days while exploring Kashmir. The itinerary I prepared included famous destinations like Gulmarg and Pahalgam; and some interior and remote areas that rarely any tourists goes to. A more detailed write up of the trip will follow later but the questions and the opinions I encountered were more or less the same; irrespective of the place. The first thing that you would notice after arriving here is that it is just the usual everyday people. People you will meet in any part of India. People going about their daily lives trying to make ends meet. It is just the regular shops, tea stalls, dhabas; portraying a perfect image of how any Indian city looks on an average day. There is no monster lurking in the dark; ready to pounce upon and kill you. There are no sinister people around eyeing you suspiciously. It is just another day in just another place for common people like you and I. You will walk down the roads and nobody will even notice you. And then you will finally get talking to some of the locals and tell them that you are a tourist there. Shortly after, you will be presented with the question that I guess is on every Kashmiri’s mind. I will quote here, not exactly word by word, but the gist of the story is more or less the same. Every single person I spoke to in Kashmir asked me this set of questions. They are all just so worried about what rest of the country thinks and talks about them. I won’t be exaggerating if I said that to some extent, it hurts them deeply to know that people of India think of Kashmir as a sinister and dangerous place. And I am really talking about the educated and sensible lot here; not the ones that get involved in the stone pelting incidents. After seeing all the clashes with armed forces and the violence on TV, it was really a little hard to believe watching these people worry about their image. Am I then saying that there is nothing wrong in Kashmir and all is well? Of course not. 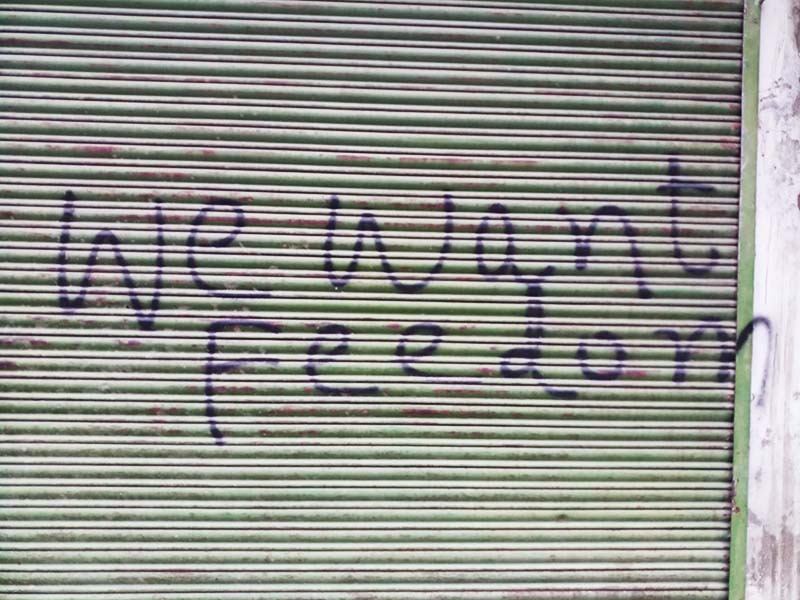 I noticed at several places walls like in the picture below; texts about freedom and an “Azad Kashmir”. There was one instance when I clearly heard someone shout “Pakistan Zindabad” from a car that drove by. No one can deny the fact that there have been incidents of tourists getting hurt and dying in Kashmir. But once you start talking to people in Kashmir, you will realize that they all have different opinions on the matter. Some people are happy with the state being a part of India while others think it would have been better if they were a part of Pakistan. Some people would be in favor of Kashmir being an independent state; not tied to either India or Pakistan. Majority of the people however cannot care less as long as they are left to go through their lives peacefully. This is the average common man who is only concerned with the safety of his family and loved ones. During my trip, I celebrated Eid in Srinagar; rode through the Srinagar city in dead of the night; visited areas like Shopian and not even once I was bothered by anyone anywhere. If it wasn’t for our motorcycles, I don’t think anyone would even have noticed us. If you travel through remote Kashmir villages, you will hear comments like “Ye aazadi vazadi sab Srinagar walo ka drama hai, hamein kya matlab is sabse”. These are the villagers, the shepherds who are only driven by earning their daily meals and keeping their families fed. They don’t know or care about the politics of all of it. There are several things that I observed in Kashmir that are worth mentioning but it will just result in a way too long post. I will add those details later in the travelogue but for now, let me answer the question of whether or not Kashmir is safe for tourists. The answer is a definite yes as long as you practice a few precautions as mentioned below. Also Read: How to Plan a Trip to Yusmarg? Being at the wrong place at the wrong time is what I call it. This is the first and most important part of the trip. Before you leave home, make sure that you keep a close check on the news for any word on protests or violence. Now when I say violence, I do not mean the clashes and encounters that go on between Indian army and the militants. That over last few decades has becomes an everyday routine here. Militants continue to cross the border over and our armed forces continue to kill them one by one. This happens in areas close to the border or remote villages and you will not be bothered by this too much. What will however definitely impact you is incidents like curfew or wide-spread stone pelting in the valley. If there has been continued violence for several days altogether in multiple parts of Kashmir, then you are better off cancelling your trip and wait for things to calm down. Tourism plays a great part in lives of the people of Kashmir. A major part of their livelihood depends on it and even they realize it. They will do their best to ensure that tourist destinations like Gulmarg, Sonamarg and Pahalgam do not get disrupted by any protests. They do so to ensure that the tourist flow in the valley continues. Unfortunately it doesn’t help much because people are still afraid to visit here anyways. But if you were planning to travel to Kashmir, they you are better off keeping only the main tourist routes in your itinerary. Avoid going towards remote regions. I am not saying that you cannot do so because even I traveled through some remote areas as well but that is not really everyone’s cup of tea. Just to be on a safer side, for your first trip to Kashmir, stick to the main tourist areas and avoid the lesser known places. Once you have been to the state and have an idea about things here, you can then plan on visiting rest some other areas. Even the clashes between Indian Army and militants usually happens in the small far off villages that you should avoid. This will apply for both Srinagar city and rest of Kashmir. Stay on the main roads and highways. While in Srinagar city, do not go wandering around in “narrow galiyan” or local “mohallas” where you have no business visiting. When going to other tourist places, stick to main highways and do not take any shortcuts through some villages. This will be in continuation to the point above. Google Map by default will show you the quickest way possible; which may include getting off the main road and crossing through residential colonies. If you are on a motorcycle then it will try to navigate you through some really narrow streets and slum type areas. This happened with me as well a few times and I even had to turn the bike around after getting stuck in a narrow gali. Just stay on main broad roads and if you are not sure, then ask the locals, cops or Indian Army personals for directions. I would advise against relying on Google maps here. When you are in Kashmir, you got to be a tourist and be as loud about it as you can. Do not act like you belong here. Hang a huge camera around your neck, put a hat on or hold a map in your hands. The idea is to let others know that you are a tourist here. People of Kashmir are very sensitive towards tourists and will do anything to ensure their safety. There have been incidents when the entire stone pelting stopped because a tourist got caught in between. Prepaid connections do not work in Kashmir so it would be wise to get a postpaid connection before traveling here. BSNL has the widest coverage here so if possible at all, get a BSNL / MTNL postpaid connection. If not, then at least carry a postpaid SIM with you because the moment you cross over into Kashmir, your prepaid phone will be as good as paper weight. I know it will not be an option for majority of the tourists but if you have a local contact in Kashmir, it would work for better. That way, if something goes wrong, then you will have a local person that you can rely on. During my trip, I stayed at Hotel Grand Valley Inn and the folks over there were very nice. It is run by a family who lives nearby. The hotel is quite close to Shalimar Bagh, Nishat Bagh and Dal Lake so location-wise too it is a great choice. Their number is 9906571500. You can give them a call and if it works out, can plan your stay here. If things go wrong while you were in Kashmir, then stay inside your hotel for as long as required and only try to get out when things calm down. Do not take a chance of crossing through while the problem still remains. No one is going to attack you inside the hotel but you may become a victim if you were out on the roads amidst the violence. And by this, I mean areas where you know something may go wrong. I will quote an example here. My trip to Kashmir happened to be in the same week that Eid was. I did not plan it that way but rather booked the tickets without checking the date of Eid. So while I was there, I did not go to Eidgah in Srinagar for my Eid prayers because I was told by the locals that there is a high chance that things may go wrong there. I offered my prayers at a local mosque instead. Similarly, you should too stick to areas where as a tourist you will go. Do not be curious and go wandering around in all the wrong places. Kashmir is a 90% Muslim area so you got to be careful with your alcohol consumption. Is Alcohol allowed in Kashmir? Yes it is but you will not find it at all the places. There are a few shops in Srinagar city selling alcohol and even most of the hotels here have that arrangement. But at other places like Gulmarg, Sonamarg or Pahalgam, there are no liquor stores so you will have to carry your own. Do not however consume it openly. Respect the feelings of the people around you and do not do something that will offend them. Even in Srinagar, there is no place that will allow you to sit down in open and have a few drinks with your friends. So while traveling through Kashmir, keep your alcohol consumption strictly indoors. Have a few drinks with your friends in your hotel room and go to sleep afterwards. Do not drink openly or decide to take a late night walk while you are drunk. At best, you will get frowned upon by everyone around you or get arrested for it. At worst, you may get in trouble with the locals and cause hurt to yourself. This will apply really to ladies only. You got to remember that you are visiting Kashmir, not Goa. You cannot afford to be walking around here in shorts or mini skirts. True that you will not really get arrested for it but will also not be appreciated. You are in a city where every woman will be covered from head to toe so you do not want to stand the odd one out wearing revealing outfits. I know it is really a personnel choice but the rule that applies is quite simple, “if you want the people around you to respect you and treat you well, then you got to respect their values and feelings”. Wearing short dresses in Kashmir will seem disrespectful to a lot of people and you should respect that. And I think that pretty much covers it all. As long as you follow the points above and keep yourself safe, you will travel through a very scenic part of our country and return home safely. Amarnath Yatra happens every year, no one is bothering them. In fact, when Amarnath Yatris got stuck after the floods of 2014, it were the Kashmiri people who kept them fed and cared for until they were evacuated.There are temples here in the valley. The Maharani temple in Gulmarg sits atop a hill in a Muslim majority region and it is safe and well cared for. There is a church as well there barely 2 minutes of walk away. You will find “Om” written at several places on the walls as you travel through; I saw one in Shopian. There are several Sikhs living in Srinagar and plenty of Hindus running their “Shudh Vaishno Dhaba” in Srinagar city itself. If Kashmir was really as menacing as everything thinks, all this would have vanished long ago. A local out here said to me “Aap Kashmir ko Dil se Jeeto, Zor se nahi” and I agree to it. Visit here, experience the scenic beauty and make these people realize that they are part of a larger dream that we all call “India”. I hope the information posted above was of help. In next part of this article, I have provided details of my Kashmir trip, including the itinerary I followed and places visited. If you have any other questions; please feel free to ask in the comments section below or at our Community Forum; and I will be glad to answer. I am Vafa Shahzad from Mumbai my Kashmir Trip is near its from 13th april 2019 but I am just little worried about it if you can give me any suggestion on that will boost my confience. Hello Vargisbhai, I am planning to visit Leh- Bike Trip via Mughal Road (Jammu – Srinagar-Leh – Manali) in Sep 19. Your all articles are really useful and helping a lot to prepare. Please keep this continue. Cheers and Thanks Again. Certainly will need your advice before that. Thanks Rajesh Bhai. Let me know if you have any questions. Hi, I am planning to tour Srinagar (Gulmarg and Pahalgam) in this week 23 mar – 28 mar. Is it safe to travel or shall I cancel my tour. Please help. Im Sakshi, thanku for lovely information.I want to ask u that im going to kashmir in may, will i get to see snow over there.Which garden is soo famous ,is tulip garden open in may. Im Sakshi you have given me ans about my ques. I want to ask u that can we shift our air tickets to any other state on any date. Do it will charge any cancellation fees.Actually we have planned to go to state other than Kashmir How much it will cost???? Im Sakshi , want to ask u that i have planned to go to kashmir after my neet exam on 11may to 19may 2019.Will it be safe for me n my family to visit ?Whether should i cancel tivkets now??? ?.Please ans me sir??? It is hard to predict anything right now. Will entirely depend on how things in Kashmir will be in May. You have written such a beautiful piece. I love Kashmir. We visited the place back in 2008 and I haven’t been able to get it out of my system yet. I am planning a trip in the 1st week of march. We know the locals and they are wonderful people. I hope things settle down by then. I would hate to cancel my trip. Do you write blogs? I’d love to read more of your work. Hi Fiona – Thank you for your kind words. This website is my blog actually. I wouldn’t recommend visiting Kashmir next week at all. Curfew is still imposed there. I have a plan for visit kashmir in 3rd week of March for honeymoon, 2019. Just had incidence of blast. Planned to visit srinagar, pahalgam and gulmarg… still have almost 1 month. Please suggest me.. is that area would be safe by army?? Is it safe to stay there..?? Hard to tell right now. I will suggest that you wait next couple of weeks and see how the situation progresses. I have a kashmiri friend in Srinagar. Is it safe to travel in Kashmir with him? If he is your friend then I guess it would be safe. Hi Raj – If you are asking in terms of safety, yes it would be fine but where exactly will you go? It would be better to take a local along in my opinion. On a second note, shopping in Srinagar would be better than the local villagers if you want to buy carpets. Hope i get to visit this beautiful place soon. Its has been always on my mind. Thank you Padmaja. It is indeed a very beautiful and must place. Hi, I am doing a solo trip to kashmir around new year, Could you please tell me if the places like sonmarg, gulmarg and yusmarg are accessible by Public transport or shared taxi in winters. As i am going alone i cannot hire a taxi. 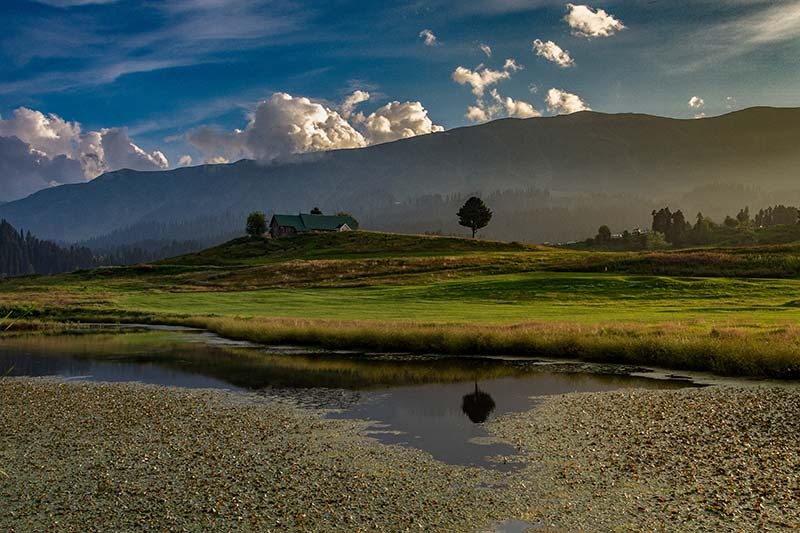 Yusmarg & Sonamarg – Depends on the weather. Road may get closed because both these places remains inaccessible in winter. Hi, we are planning to visit Srinagar, sonmarg and Gulmarg in the end of December, looking at the current condition regarding encounters and stone pelting Is it safe to visit Kashmir? Nothing to worry about right now. You are OK to go. Hi Vargis! Kudos for a beautiful write up. Actually, I came upon it while researching for a book. I have stayed in Kashmir for about three years and have intimately observed and analysed the situation there. I have read extensively about Kashmir, but your account is one of the most matured and objective. You might have written it as a travelogue, but I feel it can be cited as the most authentic analysis ever. Do I have your permission to quote and cite extracts in my book. Hi Ranjan – Thank you for your kind words. Yes, you may quote and cite extracts in your book. My family and I have planned to come to Kashmir this Dec. This place is so beautiful (Himalayas, snow, tulip garden, lake..) and the Kashmiris must be blessed to live in such a place. It is that I heard about the recent Nowgam incident and I feel concerned about security. I just wanted to be assured that such attacks would not affect the tourist locations. Many thanks for a quick update. Hi Mohini – Unfortunately, no one can give you that assurance. Tourist locations do not get affected by such incidents much but there is no guarantee. Keep an eye out on the news before your trip and if there is any violence, unrest or curfews going on at a major level then best to cancel or postpone your trip. Will the Kashmiris accept small gifts, if I bring? Hi Mohini – Yes they definitely. I have found people over there very warm to be honest. They won’t refuse. I have a plan to visit Kashmir from 6th November 2018 to 11th November.I am also scared as like others is it right decision to plan a trip to Kashmir. If there are no ongoing protests or curfews anywhere then you are OK to go. Since it is our first visit, I request you to please give me an idea on how best we can spend a 5-6 day trip from 19/10. If u can , pl suggest de places that can b covered n the type of clothes required at this time. Y daughter is very fascinated about seeing snowfall n hence pl advise in which place/s we can experience it now. Hello Natarajan – How are you going to be traveling around locally in Kashmir? By a private taxi I suppose? Mostly taxi.I believe that is the suitable option.However I am open to other modes .Would like your suggestions regarding this..would also like to know which place would be suitable to stay to get access to the tourist spots easily. Talk to Faisal at 9596410670. You can rent the taxi from him and he will help you with the entire plan. i too one among them who is really scared to think of travelling Kashmir. Especially most of our south indians would think alike me. such a beautiful place from our rishi Kashyap and we are scared to visit. But your blog really helped me to think on my opinion again at the same time confused me a lot. Why so much injustice happened to kashmiri pandits? if people in kashmir are so good, then why kashmiri pandits are still scared to go to their own land? Thanks Bharathi. And yes, I was confused as well. I wish I had an answer to your question but the best I can think of as that Kashmir is no longer an issue, a problem. It is a business now for political reasons. Business for a lot of people who are benefiting out of militancy in this region. It don’t matter if its a Muslim Kashmiri or a Kashmiri Pandit, but the price is being paid by a common man.